فتحی, مهدی, محمدی, علی, قهرمانی, نعمت الله. (1394). بهبود هم‌راستایی دقیق سامانه ناوبری اینرسی با بهره‌گیری از شرایط سکون. علوم و فناوری فضایی, 8(4), 45-51. مهدی فتحی; علی محمدی; نعمت الله قهرمانی. "بهبود هم‌راستایی دقیق سامانه ناوبری اینرسی با بهره‌گیری از شرایط سکون". علوم و فناوری فضایی, 8, 4, 1394, 45-51. فتحی, مهدی, محمدی, علی, قهرمانی, نعمت الله. (1394). 'بهبود هم‌راستایی دقیق سامانه ناوبری اینرسی با بهره‌گیری از شرایط سکون', علوم و فناوری فضایی, 8(4), pp. 45-51. فتحی, مهدی, محمدی, علی, قهرمانی, نعمت الله. بهبود هم‌راستایی دقیق سامانه ناوبری اینرسی با بهره‌گیری از شرایط سکون. 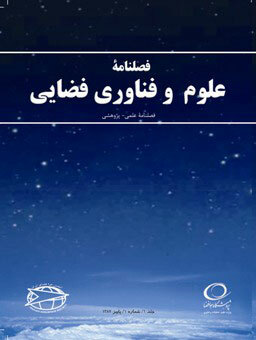 علوم و فناوری فضایی, 1394; 8(4): 45-51. در این مقاله امکان‌پذیری همراستایی دقیق و سریع یک سامانه ناوبری اینرسی (INS) متصل به بدنه در حالت ایستا با بهره‌گیری از شرایط سکون مورد بررسی قرار گرفته است. این شرایط سکون شامل سرعت صفر و یک زاویه سمت معلوم بوده که به عنوان داده‌های یک حسگر خارجی مجازی در نظر گرفته شده که اطلاعات آن با داده‌های متناظر از INS تلفیق می‌گردد. با مقایسه این دو دسته داده حاصل از INS و حسگر مجازی، تخمین‌هایی از خطاهای سرعت در واقع ناشی از خطاهای تنظیم محور INS هستند، حاصل می‌گردد. یک فیلتر کالمن توسعه‌یافته به منظور تخمین زوایای وضعیت اولیه و بایاس‌های حسگرهای اینرسی، بر اساس مدل خطای اندازه‌گیری و مدل خطای فرآیندی که حالت‌های آن بایاس‌های حسگرهای اینرسی را نیز در خود دارد، طراحی شده است. نتایج شبیه‌سازی مونت کارلو نشان داد که تلفیق اطلاعات INS و اطلاعات سکون در تراز دقیق و سریع INS بسیار مؤثر عمل کرده اما همین تلفیق به علت فقدان شتاب و سرعت زاویه‌ای با مقدار مناسب در وضعیت سکون، توفیق چندانی در تخمین و کالیبراسیون بایاس‌های حسگرهای اینرسی ندارد. In this paper the feasibility of rapid alignment and calibration of a static strapdown inertial navigation system (INS) is evaluated. Resting conditions including zero-velocity update and a known initial heading direction as virtual external measurement data are integrated with INS data. By comparing the virtual external measurements with the estimates of those generated by the aligning INS, estimates of the velocity and heading errors can be obtained and these errors will be propagated in the INS as a result of alignment inaccuracies. An extended Kalman filter based on an augmented process model and a measurement model is designed to estimate alignment attitudes and biases of inertial sensors. Monte Carlo simulation results show that the integration of INS with rest conditions is very effective in rapid and fine leveling and azimuth alignment of INS, but this type of data fusion due to poor acceleration and angular rates of static condition has no chance of valuable calibration of all inertial sensor biases. Yu, M. J., Lee, J. and Park, H., “Comparison of SDINS in-Flight Alignment using Equivalent Error Models,” IEEE Translation Aerospace Electronic System, Vol. 35, No. 3, 1999. Won Park, H., Lee, J, G. and Park, Ch. G., “Covariance Analysis of Strapdown INS Considering Gyrocompass Characteristics,” IEEE Translation Aerospace Electronic System, Vol. 31, No. 1, 1995. Shin, E.H., “Estimation Techniques for Low-Cost Inertial Navigation,” The University of Calgary, (Thesis PhD), 2005. Titterton, D. H. and Weston, J. L., Strapdown Inertial Navigation Technology, London: Peter Peregrines, 1997. Pusa, J., “Strapdown Inertial Navigation System Aiding with Nonholonomic Constraints using Indirect Kalman Filtering,” Tampere University of Technology, (Thesis M. Sc.) , 2009. Hematite, M. and Masonic, M. A., “Fine Alignment of Strap down Inertial Navigation Systems in Rest Condition,” in AERO-2004, 2nd International & the 5th National Conference of Iranian Aerospace Society, 2004, (In Persian). Skog, I., Low-cost Navigation Systems: A Study of four Problems, (Thesis PhD) in signal Processing,” KTH, Stockholm, Sweden, 2009. Grejner-Brzezinska, D.A., Yi, Y. and Toth, C.K. “Bridging GPS Gaps in Urban Canyons: The Benefits of ZUPTs,” Navigation, Vol. 48, No. 4, 2002, pp. 217–225. Xinlong, W., “Fast Alignment and Calibration Algorithms for Inertial Navigation System,” Aerospace Science Technology, Vol. 13, No. 4–5, 2009, pp. 204–209. Lu., Sh., Xie, L. and Chen, J., “New Techniques for Initial Alignment of Strapdown Inertial Navigation System,” Journal of the Franklin Institute, Vol. 346, No. 10, 2009, pp. 1021–1037. Acharya, A., Sadhu, S. and Ghoshal, T.K., “Improved Self-Alignment Scheme for SINS using Augmented Measurement,” Aerospace Science and Technology, Vol. 15, No. 2, 2011, pp. 125–128. Salehi-Amiri, S.M., Initial Alignment and Calibration Performance Enhancement of a Gimbaled INS using an Optimal Stochastic Close Loop Control, K.N. Toosi University of Technology, (Thesis PhD), 2014. Meskin, D. G. and Bar-Itzhack, I. Y., “Observability Analysis of Piece-Wise Constant Systems Part I: Theory,” IEEE Transactions on Aerospace and Electronic Systems, Vol. 28, No. 4, 1992, pp. 1056–1067. Lee, J. G. C. G. Park, and H. W. Park, “Multiposition Alignment of Strapdown Inertial Navigation System,” IEEE Transactions on Aerospace and Electronic Systems, Vol. 29, No. 4, 1993, pp. 1323–1328. Uhlman, J.K., “Algorithms for Multiple Target Tracking,” American Scientist,Vol. 80, No. 2, 1992, pp. 128–141. Siouris, G.M., An Engineering to Optimal Control and Estimation Theory, John Wiley & Sons, 1996.